That was my Thai family’s response when they heard Americans put pumpkins in a pie and call it a dessert, and that it’s supposed to be good. That was my response to my Thai-coworkers during our lunch break when I they told me the vibrant yellow orange veggie mixed with egg on their plate was pumpkin. Thailand and America both have pumpkin, but as you can tell, we totally don’t treat it the same way. But we’ve both got something awesome going down because American pumpkin pie, and Thai Stir-Fried Pumpkin with Eggs are both delicious ways to eat pumpkin! 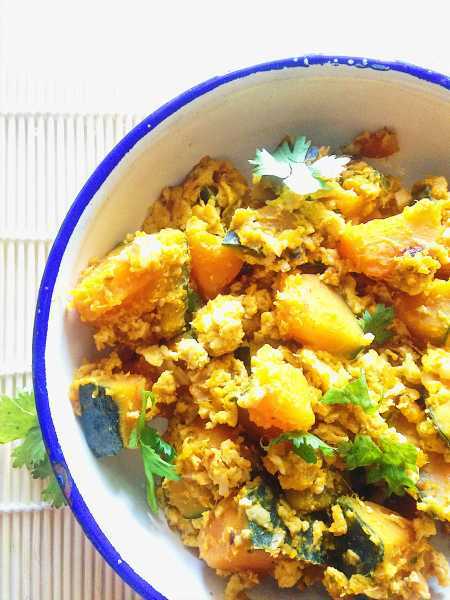 Stir-Fried Pumpkin with Eggs, is made with what looks like a pumpkin, but technically what I use is called is kabocha squash, or a Japanese pumpkin, as shown in the pic above. I like kabocha squash’s sweet flavor and how it holds up well when stir-fried, so it doesn’t become watery mess. Also, it doesn’t have to be peeled, unless you want to, so yay, one less step! But when I asked the produce guy at our grocery store if they had it he had not a clue what I was talking about. So I went to the Asian store in search for it, and it was sitting right there, and labeled Japanese Pumpkin/Kabocha Squash, love me some Asian stores. If you can find Thai pumpkin, of course use that. You can also use butternut squash, but make sure you peel it. I wouldn’t use traditional American pumpkins because they would fall apart and taste weird. Warning, give yourself some extra prep time to chop the pumpkin! Try it today, and I want to see too! Share your pic with me on Instagram, and tag me @thaifoodie! 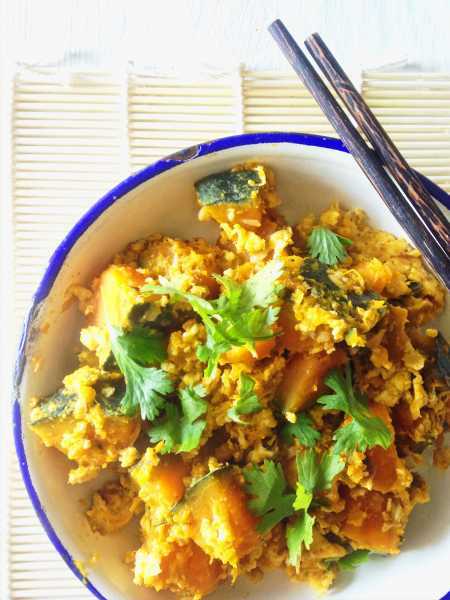 Love how this traditional Thai dish becomes a quick, homey weeknight meal with just a few ingredients like pumpkin, garlic and eggs! Use the sharpest knife you have to cut the pumpkin or squash into quarters, and remove the seeds. Then cut into 1-inch-ish cubes. Add a few tablespoons of oil to your wok over medium-high heat, and add the garlic. Stir-fry garlic for a minute or so until fragrant. Add pumpkin, fish sauce and oyster sauce, and enough chicken broth or water to cover it. Some pumpkin pieces may be sticking up, but that's ok. Put a lid over the wok. Bring to a boil, and let boil for 5-8 minutes or until pumpkin is fork-tender, and most of the liquid has evaporated. My Thai Hubby likes to have enough liquid left for a sauce, but do what you prefer. Push the pumpkin to the edges to make a well in the center of the wok. 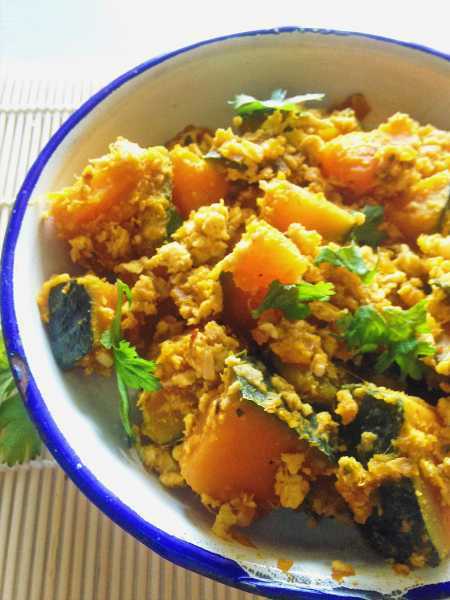 Pour in the eggs and scramble until set, and then mix in with pumpkin. Add more fish sauce or oyster sauce to taste, and sprinkle with white pepper powder, and turn off the heat. Sprinkle cilantro on top if you wish, and enjoy with jasmine rice! You can also add ground pork, beef or tofu if you want to make it even more filling, which they do in Thailand sometimes. Just cook the meat first, and then add in the pumpkin, and add extra fish sauce or oyster sauce to taste. Hi, I would like to know. 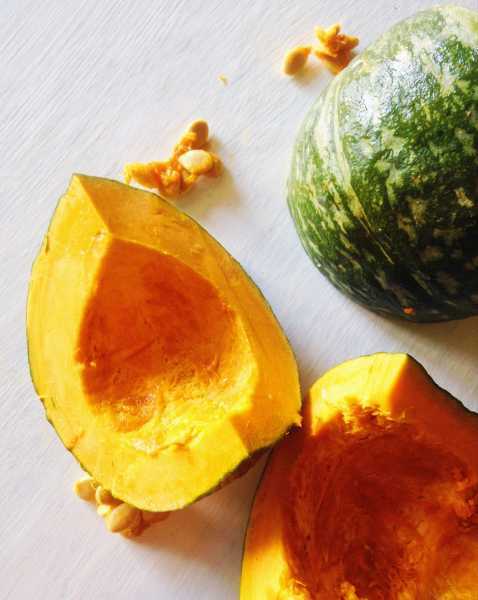 What is the diffrence between orange and green kabocha? If I’m using orange kabocha, do I need to peel the skin? Great question! 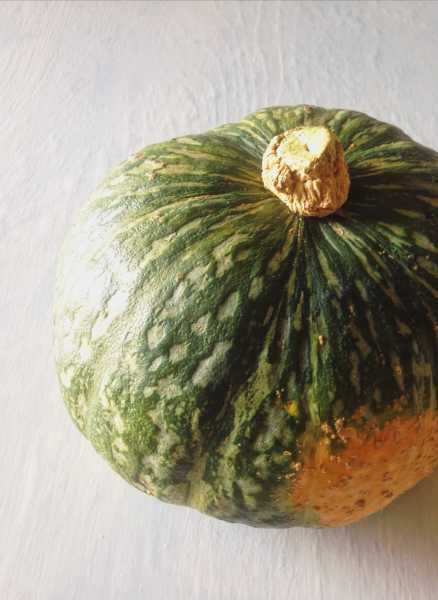 Orange kabocha squash is another variety of kabocha, so apparently it tastes the same as the green kabocha, it’s just a different color on the outside. I’ve never cooked with the orange variety, but I researched it, and you can leave the peel on or off just like with the green variety, so it’s your choice!